MADISON, WI--(Marketwired - December 06, 2016) - Teenagers from New York to Tennessee and Illinois to Wisconsin will earn lifelong skills through the growth of DreamBikes, a non-profit 501(c)3 organization that places used bicycle stores in low-to-moderate income neighborhoods to provide hands-on, paid job training to local teens and to offer affordable and accessible bikes for the community. "Working in conjunction with local youth organizations, we employ teens from the community and provide work experience that will give them the skills they need to open up future job opportunities," said Adam Kostichka, executive director of DreamBikes. "We also strive to get more people on bikes by making them affordable and accessible. We believe these things make our communities stronger." The non-profit 501(c)3 is growing nationally to include four additional locations: Rochester, New York; Knoxville, Tennessee; Calumet City, Illinois; and Madison, Wisconsin (Madison North). These locations will join two existing DreamBikes locations in Wisconsin (Madison West; 4245 W. Beltline Highway, and Milwaukee; 2021 N. Martin Luther King Dr.) with the goal of additional growth in the future. 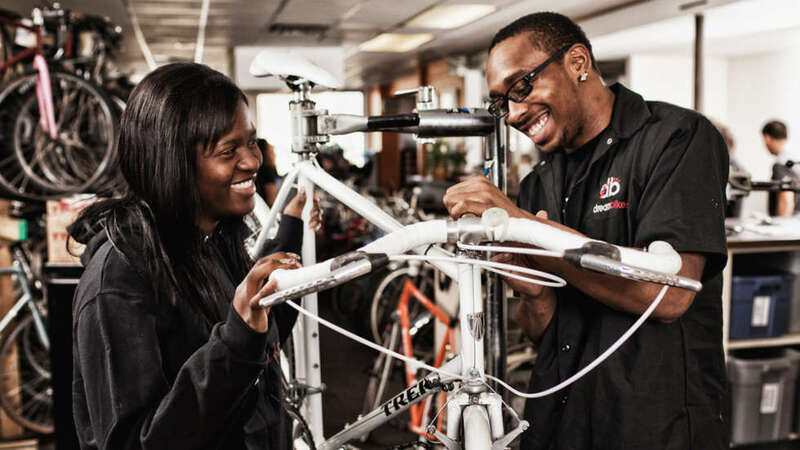 As part of their hands-on experience, DreamBikes employees learn how to refurbish and repair used bikes, deliver great customer service to people looking to buy a used bike or bike accessories, and run the store. They also take their skills beyond the bricks and mortar of the stores by fixing bikes for free at on-site community events. Further, DreamBikes aims to facilitate scholarships and job placement assistance for its employees. The Madison North location (1131 N. Sherman Ave.) recently opened. The three remaining new locations are in the first phase of training staff, with a targeted opening date of spring 2017. Headquartered in Waterloo, Wisconsin, DreamBikes places used bicycle stores in low-to-moderate income neighborhoods to provide hands-on, paid job training to teens to offer affordable and accessible bikes for the community. Working in conjunction with local youth organizations, DreamBikes offers lifelong skills to teen employees, helping them to shift gears and find a bright future. For more information about this non-profit 501(c)3 organization, visit www.dream-bikes.org.